Aerodynamic testing is conducted in a controlled environment like a wind tunnel or a velodrome (that crazy oval, banked track you see during the Olympics). Although each environment has its pros and cons, we chose to go with the velodrome. Why? 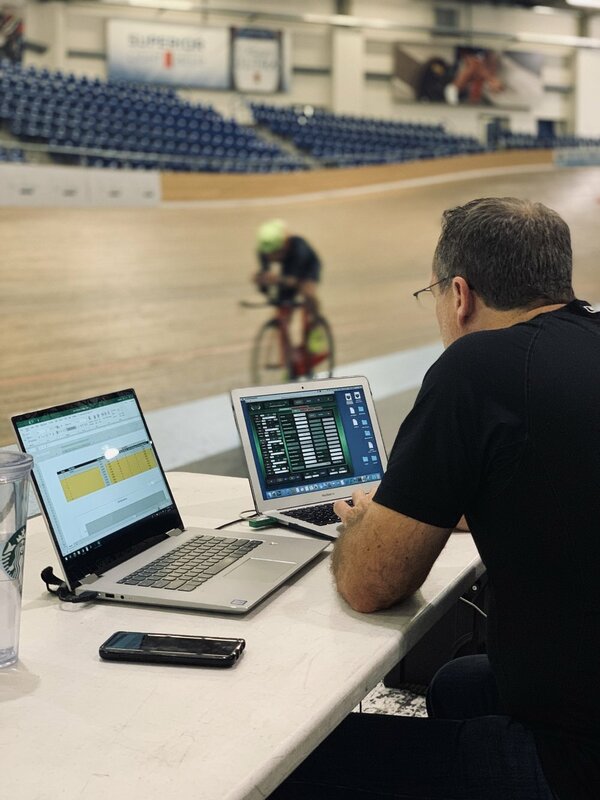 Well, riding on the track is a better race day simulation for the athlete and it gave us an opportunity to work with the AeroGuru, Jim Manton, of LA-based ERO Sports! Both Josh (of Output) and Gui took less conventional methods of getting to to the LA Velodrome. Josh biked a silly-but-awesome 380 miles from SF to Santa Barbara; Gui flew directly from Florida (with his shiny new Quintana Roo PRSix) where he was supporting a Matt Hanson Coaching camp. After navigating the maze-like Dignity Health Sports Park (home of the LA Galaxy and LA Chargers), we pulled up to the stunning VELO Sports Center. At that point, we knew we were in for a treat of a day. The key to any testing is to have a precise, predetermined protocol. Testing trials are preciously limited due to time and the athlete’s ability to hold steady and consistent laps. The objectives, in order of priority, were to test bike position (body and hand position), helmet choice, hydration equipment/position options, and kit (sleeved vs. sleeveless). Although manufacturers claim “X” watt savings with their products, thanks to differing body shapes, environmental conditions, and a whole bunch of other factors, it’s really a multi-variable outcome (i.e. one thing doesn’t solely depend on itself alone). Through 12 trials, and 4 hours, on the velodrome (each trial being a different iteration), we uncovered a significant drop in drag coefficient. Basically, FREE WATTS! Although we won’t be sharing actual numbers and equipment choices (for Gui’s privacy) the biggest gains were found in a lower and narrower position, with a “high” hand position. And of course, Gui will test this position on the road to make sure it’s sustainable. We also uncovered a substantial difference in drag coefficient between helmets. This was surprising because the helmets have tested equally well for some other athletes, but with Gui, one tested significantly better than the others. This sort of finding is what makes aero testing beneficial. Results vary for each person and can’t be determined simply by adding manufacturers “watt savings” on top of each other.